A day on our own. The tour group was going to optional tours, such as Shark Cage Diving and Wine Country. We had planned our own day before we left home. I should mention that we always buy the DK guidebook to anywhere we plan to go. They are not cheap but are in full color and have wonderful advice. The pictures provide a souvenir as well. The South Africa version included a section on game spotting. 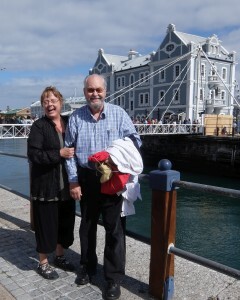 So Ron and I returned to Victoria Wharf. We shopped and greatly enjoyed the Water Shed, a cavernous building of tin siding full of booths selling arts and crafts. The US $ is at a great rate vs. the Rand right now and we found fabulous bargains and endless cleverness. 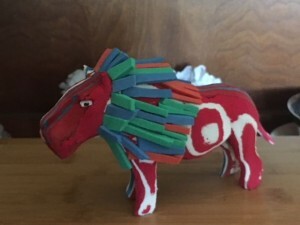 The lion [and many other animals] are made from used flip flops, glued together and carved. 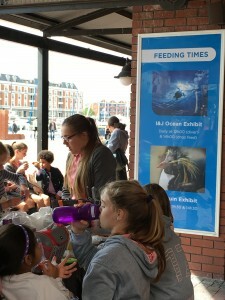 We had cold tabouleh and husami [rice pilaf and fried cheese] for lunch and made our way to the Two Oceans Aquarium. 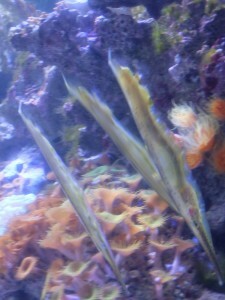 As we entered, we could already see a feeding frenzy taking place. I was hoping from the name [Two Oceans] that the aquarium would be set up to compare and contrast the Atlantic and the Indian Oceans, which do come together off the southern coast of Africa, not at the Cape of Good Hope, but Cape Agulhas. 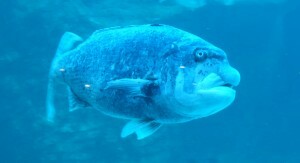 Although it was a nice aquarium, with a truly fine café latte in the snack bar, it was modest in scope. We saw a number of critters we’re not familiar with. And a nice display of African penguins which was nifty but paled in comparison with the wild ones. 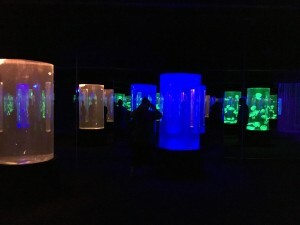 The jellyfish display was psychedelic. Right outside the aquarium was a large low building that we took for a grocery store, but was in fact, an array of food booths like you find at major urban rail stations. Both take-away foods and food fixings, we bought some Malay spices and candy [for our hosts, see below]. We rested a bit [2 hour nap!] and freshened up, for our dinner was to be at the home of a local family [an optional tour, that we are growing very fond of]. We bussed to the home of proud “colored” family, the Gordons. Under apartheid, regular folks like you and me would be classed as “colored” if you had any mixed ancestry. Melting pot, in other words. Might be black African, Indian, Malay or any other mix. This is not a shameful term to most of these people, they told us, and welcomed any questions. 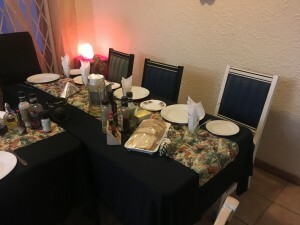 Our hostess had made us a lavish dinner of Cape Cuisine dishes, which included a mix of spicy chili-like stew based on Indian spices; wraps of pita and hashed meats; flavorful rice dishes, with a pudding dish for dessert. · 20th century attempt to keep the races separate [but “equal”], the results of which we are all still dealing with.